The Fellowship was fortunate enough to obtain a copy of FIVE GHOSTS: THE HAUNTING OF FABIAN GRAY #1 from Image Comics. Frank J. Barbiere writes and Chris Mooneyham draws. Fabian Gray is an almost legendary treasure hunter, and the reason for that is the accident he had with the magical artifact. It imbued him with the abilities of five fictional characters. He’s got one quest he has to complete, and he needs to do it quickly; it appears that he’s starting to come apart at the seams. So he takes off for Africa, and there he runs into some trouble (of course). Modern fantasy adventure is a style that isn’t done much, for some reason. I suppose it’s difficult to make it believable in a world so similar to our own. But Fabian is a very believable character, even when he’s being magical, and that really helps this story work. And the story has a pulp-adventurer feel to it, which adds excitement. The book doesn’t spend much time on backstory, but that allows it to jump right into the action. It does a nice job of setting up its own story, though, which promises to be an exciting one. Check it out. 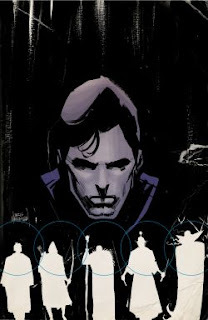 FIVE GHOSTS: THE HAUNTING OF FABIAN GRAY #1 is available now at your FLCS or by order at imagecomics.com.